← The First Sunday in Lent. Sixth Sunday in Honor of St. Thomas of Aquinas. Posted on March 5, 2017 | Comments Off on Sixth Sunday in Honor of St. Thomas of Aquinas. CONSIDERATION FOR THE SIXTH SUNDAY. St. Thomas’s Love for Mary. FIRST POINT.—Consider the love of the Angelic Doctor for Mary. His biographers find signs of it even in his childhood. (See Trait, end of the present consideration.) It is not at all to be wondered at that the Queen of Angels should have taken possession of the Angel of the Schools even in his earliest days. The greatest minds have always been powerfully attracted to Mary, who is justly saluted as the Seat of Wisdom. As Jesus gathered around Him virginal souls; viz., Mary, Joseph, John, so too does Mary draw after her the innocent, the virginal, the pure. It would have been strange, indeed, if St. Thomas who, as we know, always carried about him a relic of St. Agnes, such was his admiration for the spotlessness of the saint, had not most tenderly loved and devoutly honored the Immaculate Virgin of virgins. The holy Doctor has given us sufficient points in his own life and writings, to indicate clearly his love for the Queen of Heaven. In this he imitates St. Bernard, that ardent lover of the Mother of God; and the fact of his having given up his soul to God in a Cistercian monastery which, like almost all the churches of this Order, was dedicated to the Blessed Virgin, was certainly not due to what we call chance. The great Angel of the Schools maintained what at that time in the Church was the clearly and openly expressed opinion, and spoke of Mary as only the most zealous servant of the glorious Virgin could speak. He taught of her in his explanation of the Angelical Salutation: “She is called full of grace,” because she had in her soul the fulness of grace, no sins but all virtues. From her soul the blessings of grace flowed out upon her body and prepared her to be the dwelling-place of the Son of God. Yes, even upon all mankind, upon all their needs and dangers, flow streams from her plenitude of grace. Help and strength are given by her to every virtue, for to her is applied this verse of the Canticles: “A thousand bucklers” hang upon this tower of David against all the snares of the enemy; and this word of Ecclesiasticus finds in her its fulfilment : “In me is all hope of life and of virtue.”—She far excels the angels, as well in grace and riches as in nearness to God; for to the angels, God stands in the relation of Lord, but to Mary in that of Son. Yes, she is higher than the angels themselves in purity; for she is not only pure in herself, but she helps others on to purity. No guilt, no malediction of sin ever weighed upon her. She brought forth without labor, lived without the pressure of a sense of guilt, and died without decay; for Mary’s body and soul are in heaven. Esteem is the foundation and preliminary condition of love. How great must the love of St. Thomas have been for Mary of whom he draws such a picture for himself and for the whole Church, of whom he is so fond of speaking! 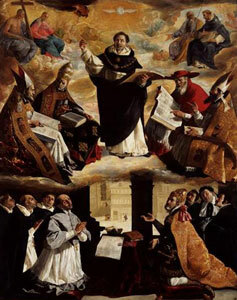 A secular witness in the Process of Canonization, John Blasius, a Neapolitan judge, and courtier of the Queen of Sicily, relates that he once heard St. Thomas preach a whole Lent upon the words: “Hail, Mary, full of grace, the Lord is with thee,” and noticed that whilst speaking he kept his eyes shut, or raised in contemplation to heaven. Truly would it be a privilege to hear an angel in human form discourse upon the grandeur of Mary, upon the mysteries that were wrought by her co-operation. That would, indeed, be an impressive sermon. But dost thou not hear St. Thomas preach when thou sayest the holy Rosary? Is it not a greater privilege to be allowed to speak so familiarly, so confidently, like a little child, to Mary whom St. Thomas so magnified, whom he so dearly loved, than even to hear him sound her praises?—Hast thou hitherto rightly estimated this happiness? Hast thou ever reflected upon the honor thou enjoyest of being able to commune lovingly and heart to heart with the Queen of heaven as often as thou desirest? Such a privilege as this thou canst not enjoy with thy equals. Hast thou ever considered that it is a bad sign not to be on terms of intimacy with her without whom no grace can be received, since all graces flow through her hands? Dost thou understand that sermon of St. Thomas wherein he explains how Mary is full of grace? If she has the fulness of grace, it cannot be thought that any one can obtain a share in those treasures, excepting through the intercession of her to whom they are all intrusted. SECOND POINT.—Consider how Mary returns and rewards the love borne her. William of Thoco, one of St. Thomas’s biographers, tells us that the holy Doctor, when on his death-bed, revealed to his friend and companion, Reginald of Piperno, for the honor of God and the consolation of his confrere, that the Blessed Virgin and glorious Mother of God had appeared to him and set his mind at rest with regard to his life and his learning. Whatever he earnestly begged of God through her, especially that he might never be forced to abandon the position of a simple religious, he had always obtained. “The holy Doctor,” continued, the narrator, as all his confessors unhesitatingly declare, preserved his virginal purity; he was white as snow in soul and in body. The most powerful of women, the sweet Mother, does not confine herself to the choirs of the heavenly court; she deigns likewise to impart to the pilgrims of earth the consolation of her presence. Whilst reigning as queen near the throne of her Son, she casts her merciful eyes upon her poor children of earth. “With good reason is it thought that she obtained for her devoted Doctor that learning which made him so famous, as well as the lily of chastity which he sacrificed to God and ever preserved inviolable. O how happy am I to have discovered this way to wisdom and holiness, to purity and knowledge! St. Thomas has trodden it, in order to show me how one can go to heaven by a path of roses; can join the choirs of angels; yes, can even become like to the angels. How sweet to stay near Mary and with her to labor! She is the dwelling-place of virtues, a medicine of life, an abyss of grace. All that is not God is less than Mary. God Himself could not have created a greater Mother than the Mother of God—and that great Mother, as soon as I wish it, will become my Mother, and will remain such as long as I allow her. She who bore in her arms Him who sustains the world, will help me to carry every sorrow. She is the throne of mercy, to which all may have access. No client of Mary will ever be lost. But he that does not piously honor her, is not her client; and he that does not love her, does not truly honor her; and no one that does not imitate her, loves her sincerely. I will, therefore, in future prove my love to Mary, and daily beg St. Thomas to help me to be faithful to her. O Mary, glorious Mother of Jesus Christ, most pure Virgin, powerful Queen of heaven! Behold I come to thee sorrowful for my past infidelity. As to St. Thomas, so also to me hast thou given rich graces and blessings, yes, long before I could begin to salute thee; and thou didst not cease to love me long after I had grown tepid and negligent in thy service. O do not now abandon me, since my saintly Master has opened my eyes to see again how happy thy children are under thy protecting mantle and near thy pure heart! Now will I remain unshaken in my fidelity to thee, untiring in my efforts to bring others to thee; now will I constantly aim at procuring thee and thy children honor. Forsake me not, O Mother of Mercy! Thou art the Mother and special Patroness of the Order whose brightest ornament St. Thomas, under thy maternal assistance, became. Behold, I too will become a spiritual child of this holy family, whose chief duty it is to preach Jesus Crucified and, by their glowing words, to enkindle in the hearts of the faithful ardent love for thee, His Mother. As far as I can, I will engrave in all hearts, but first of all in my own, thy name in ineffaceable characters. And do thou, holy, angelic Master, thou the scholar, the lover, the preacher, the sacred Doctor of Mary, do thou teach me to love Mary with that pure, intelligent, faithful and persevering love with which thou, from thy early childhood until thy last hour, didst love her and of which thou didst give her daily and tender proofs! Ah, then, when I go into “the house of my eternity,” I shall, in ecstasy of soul and jubilation of heart, pronounce that “Ave Maria,” that sweet salutation, which produced so great an impression upon thee before thy infant tongue could lisp its accents! This entry was posted in Six Sundays in Honor of St. Thomas of Aquinas and tagged Ave Maria, St. Thomas Aquinas. Bookmark the permalink.